ALL HAIL THE YETI Unveils New Video, "Slow Season"
If you are unfamiliar with Los Angeles’ ALL HAIL THE YETI, well now’s the time to jump on-board. 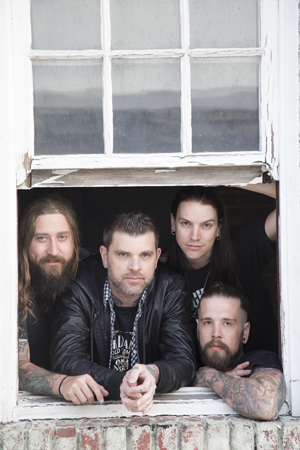 The band delivers modernized, pure American heavy metal laden with punishing grooves and catchy hooks, all backed with a dynamic front-man who commands the stage with ferocity and vigor! They just wrapped-up the recording process for their yet-to-be titled third full-length offering, which is set for a release later this year produced by the three-time Grammy award winning Warren Riker. In the meantime, a brand-new track, “Slow Season” can be seen NOW on KNAC.COM HERE via the form of a killer, high-intensity, live-performance video that truly captures the essence of the band’s high octane live show. If you are in the European/UK area this month, be sure to check out the band’s tour-dates at https://www.facebook.com/officialallhailtheyeti, as they are coming out that way supporting 36 CRAZYFISTS, which is now underway! Connor Garritty (Vocals) states: We are all beyond excited for this new video release! It was a true pleasure to work once again with the master, Brian Cox (HOLLYWOOD UNDEAD, GEMINI SYNDROME), who continues to impress every time. This marks our fourth consecutive music video with him directing and we know you will be as stoked with the finished product as much as we are. This new song, "Slow Season", will also be on our new album on Minus Head Records, which is currently tentatively slated for an early summer release. “ While always progressing and trying our best to step outside the box, we have kept the classic YETI sound with a few new hooks sprinkled here and there. "Slow Season" proves just that, as Alan (guitars) and I have really come together and hit our stride. The material has matured, along with the rest of the band to ultimately deliver the most diverse, yet aggressive and powerful release yet! We are coming to leave our definitive mark on the heavy music scene and plan on touring non-stop across the world to spread the word. Hope all our European/UK fans can catch us on this 36 run, which is now about to be in full swing. Come hang and say hello. Lets party, it’s going to be our biggest year yet!